Error message: "GrindEQ Math Utilities are not properly installed"
Error message: "Word experienced an error trying to open the file"
Error message: "Cannot use Equation Editor 3.x format"
Error message: "Ghostscript is not installed"
In order to accomplish the installation of GrindEQ Math Utilities you must have the Administrative Rights on your computer: right click on the executable file and select Run as administrator. Close Microsoft Word. It is also recommended that you close all other running applications. Run 'GrindEQ_Math_Utilities_N.exe' (where N is the version) and follow the installation instructions. Close Microsoft Word and GrindEQ Options. Choose the GrindEQ Options from the Windows Start menu, and select Uninstall* from right-click menu. Otherwise, open Settings* from the Windows Start menu, and start Programs and Features. Otherwise, open Control Panel, and start Add or Remove Programs. A dialog will be displayed with the list of installed apps. Select GrindEQ Math Utilities and follow the instructions. If the GrindEQ Math ribbon still appears on Microsoft Word menu, remove the template GrindEQ.dotm from Microsoft Word Startup folder manually. To locate the current Startup folder select Word Options | Advanced | File Locations.... Close Microsoft Word before removing GrindEQ.dotm. GrindEQ Math Utilities are signed with a digital certificate. If Microsoft Word Security system gives a notice about new macros found, please register GrindEQ Certificate (the registration of GrindEQ Certificate is free of charge). GrindEQ converters can be used without macros (therefore without a Certificate registration) from Save As... or Open dialogs. Some of GrindEQ modules (LaTeX-to-Word, Word-to-LaTeX, and MathType-to-Equation) require registration. Please visit registration page to obtain your unique registration code. Close Microsoft Word and choose the GrindEQ Options from the Windows Start menu. And then enable (or disable) optional GrindEQ Math ribbon, which will be integrated into Microsoft Word. 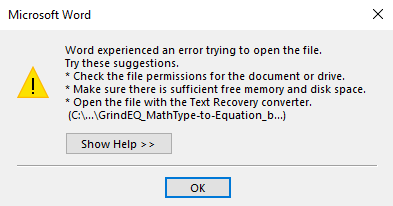 If GrindEQ Math ribbon is still not available, copy the template GrindEQ.dotm, which can be found in the main folder on the GrindEQ installation path, to Microsoft Word Startup folder. To locate the current Startup folder select Word Options | Advanced | File Locations.... Close Microsoft Word before copying the template file. Download the latest version of GrindEQ. Close Microsoft Word, run GrindEQ install, and choose Uninstall your previous version option. Microsoft security system blocks all documents downloaded from Internet. If you try to open such a file, you will get the following warning. In this case you must unblock your file manually: right-click the Word file, and click Properties, and then check Unblock. The conversion option is probably enabled in your equation editor. 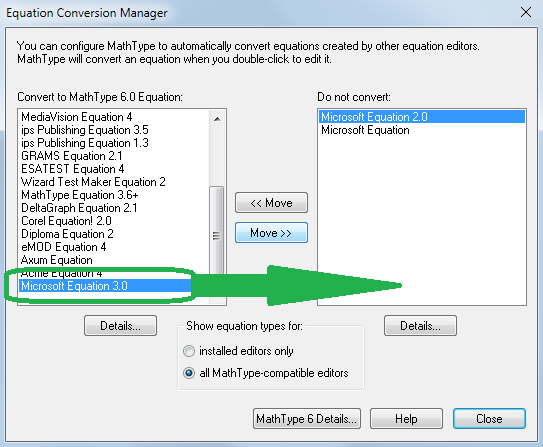 Use Microsoft Equation instead of Equation Editor 3.x, or you have to turn off the Convert to MathType option in MathType's Equation Conversion Manager. To run the Equation Conversion Manager, choose it from the MathType sub-menu of the Windows Start menu. A dialog will be displayed with two lists of equation types. Use the Move» button to move Microsoft Equation type from the left list (Convert to MathType) to the right list (Do not convert). Make sure a Ghostscript driver (free under GPL license) is installed on your machine, otherwise EPS/PS image files won't be converted. Please download Ghostscript from GrindEQ or ghostscript.com. Use Ghostscript driver 64-bit if and only if you have Microsoft Word 64-bit installed on your machine (open Microsoft Word, on the File tab click Account; click on the About Word button for obtaining information about your version of Office). Equation Editor 3.x is not supported by Microsoft anymore. If you use Equation Editor 3.x, make sure it works properly (just try to create an equation). It is strongly recommended to use Microsoft Equations or MathType instead of Equation Editor 3.x. Old versions of Microsoft Word need more time for updating Microsoft Equations. If you use Microsoft Word 2010 (or earlier), setting English as the default language of spelling will dramatically improve updating speed of your document. 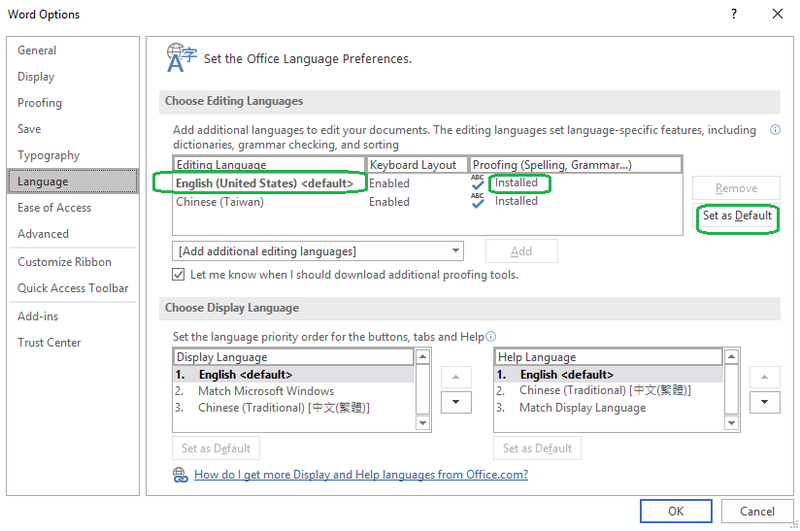 This does not change checking spelling of your document, so you can enable (or disable) it anytime: open Language tab of Microsoft Word Options, select English from Editing Language list, press Set as Default button, and then press OK. Note, you do not need to change Display Language and Help Language options. Change LaTeX encoding (LaTeX-to-Word Options, General page) and/or uncheck Always read LaTeX preamble option. (e.g. use pdftex driver instead of dvips). Please note, if you use EPS format for images, you have to check Hide file extension option. If you use non-standard graphical objects in your Microsoft Word document, Word-to-LaTeX may convert them as empty rectangles. Please use freeware GrindEQ Image-to-PostScript utility to convert non-standard graphical objects to EPS format. If you can't find a solution for your problem send an e-mail to our technical support department at support@grindeq.com. You can create GrindEQ system report and send it (as plain text or as an attached file) along with the description of the problem. This report contains information about installed system and GrindEQ files. Including the report may greatly simplify the problem tracing and solving. No private information is included in the report, you will be able to view the report before sending. To create GrindEQ system report press Create button accessed via Math | Options from Microsoft Word menu or GrindEQ Options from Windows Start menu. You can also create GrindEQ system report by running 'dump' program in the main folder on the GrindEQ installation path. The default encoding of the report is Unicode (UTF-16LE).